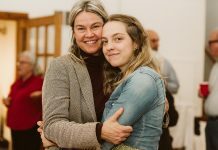 The Regional High School was bustling last Thursday night, Oct. 13, as students poured in for an enticing array of Adult Community Education of Martha’s Vineyard (ACE MV) classes. There was Belly Dancing, Spanish and Portuguese language classes, Tips on Parenting, guidance on Medicare’s mysteries, and more. But perhaps the most enticing of all — thanks to the mouthwatering aromas wafting out the classroom door — was Chef Marvin Jones’s Frugal Soup class. Inside Room 111, Chef Marvin was leading about a dozen food enthusiasts wanting to improve their skills and expand their knowledge in the technique of making soup. The theme was how to create a healthy, tasty pot from food that may be in the refrigerator, nearby farmstand, or even backyard garden. The room, set up as a cooking classroom, was appointed with several work stations including ranges, sinks, refrigerators, and lots of counter space. In line with belief that doing, not watching or reading, is the best way to learn, he set the class to work at once. Students divided into three groups and delved right in, chopping shallots, onions, potatoes, and starting them sautéing. They pried succulent clam meat from the shells and prepared it for chowder. Although he has countless cookbooks at home, and had one of them, “Simple Soups,” on hand, the chef said that most his recipes are his own and involve improvising on basic themes. Mr. Jones is a familiar figure on the Island and has cooked at a number of establishments here from the Edgartown Yacht Club and the legendary Seaview years ago, to his own popular Lobster in the Bluffs during the 1990s. His resume includes stints in kitchens abroad and in the Caribbean as well. Every April he is a friendly, helpful presence at Camp Safe Haven, preparing healthy breakfasts and lunches for the camp staff and youngsters affected by AIDS. These days he creates delicacies in the Vineyard Grocer kitchen for the prepared food section at Tisbury Farm Market. He also serves a daily hot soup lunch at Tisbury Farm Market now that days are turning chilly. Vineyard Grocer sponsored this class. Back at the ranges, sautéed vegetables had been combined with various soup stocks, accented with herbs and spices, and pots were simmering with great promise for the product to come. There was a Butternut Squash Puree, delicately but exotically spiced. The Cream of Broccoli was green and hearty. 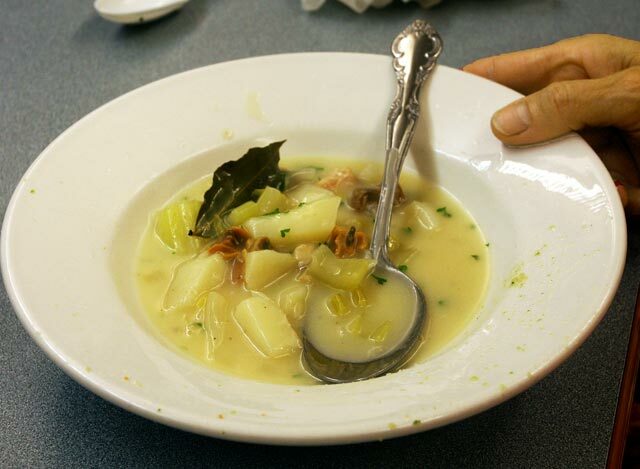 Clam Chowder was true Vineyard comfort food, combining the savory seaside flavor of clams with smooth potatoes, onions, and the luxury of heavy cream. As an added surprise bonus there were fresh Vineyard mussels steamed in an aromatic wine and shallot broth. At last, dinner was served. After all their hard prepping and learning, the class members sat down together for a delectable meal — always a prime benefit of the ACE MV cooking classes. After two hours packed with working, learning, socializing, and eating, the students left well-satisfied, armed with ideas and inspirations for making hearty and satisfying soup in these upcoming cool months. And who knows? They may even clean out their refrigerator drawers, use up leftovers, and help keep their houses warm while they’re about it. For a sweet change of pace from savory soup making, the next scheduled cooking class is The Art of Cake Decorating (Nov. 3), said ACE MV director Lynn Ditchfield, For a more off-beat culinary adventure, Suzan Bellincampi leads four afternoon sessions on foraging for and preparing wild edibles at Felix Neck, beginning Oct. 27. Ms. Ditchfield called the upcoming Cultural Festival “the biggest cooking news this fall.” The Nov. 19 event features a sumptuous ethnic and international food court, along with music, booths, and silent auction, all to benefit ACE. The winter semester includes an Island history-themed series in collaboration with the Martha’s Vineyard Museum including Yankee, Portuguese, African-American, Cape Verdean cuisines, and more. “We hope to offer the popular Valentine special with Chef Christian Thornton of Atria and Indian cooking with Jan Buhrman of Kitchen Porch,” Ms. Ditchfield concluded with mouthwatering promise. For more information visit acemv.org or email director Lynn Ditchfield at lynn@acemv.org.